DIE Lunæ, 7 die Januarii. Bill to illegitimate Lady Roos's Children. Epus. Rochester. Johannes Ds. Robertes, Custos Privati Sigilli. Robertus Comes Lyndsey, Magnus Camerarius Angl. Edwardus Comes Manchester, Camerarius Hospitii. Vicecomes Mordant. Ds. Arlington, One of the Principal Secretaries of State. Hodie 2a vice lecta est Billa, "An Act for the ascertaining the Bounds of the several Rectories of Swaffham St. Cyriack and of Swaffham St. Marie's, within the Town of Swaffham Prior, in the County of Cambridge, and for the uniting of the Two Churches there." Their Lordships, or any Five; to meet on Wednesday Morning, at Nine of the Clock, in the Prince's Lodgings. 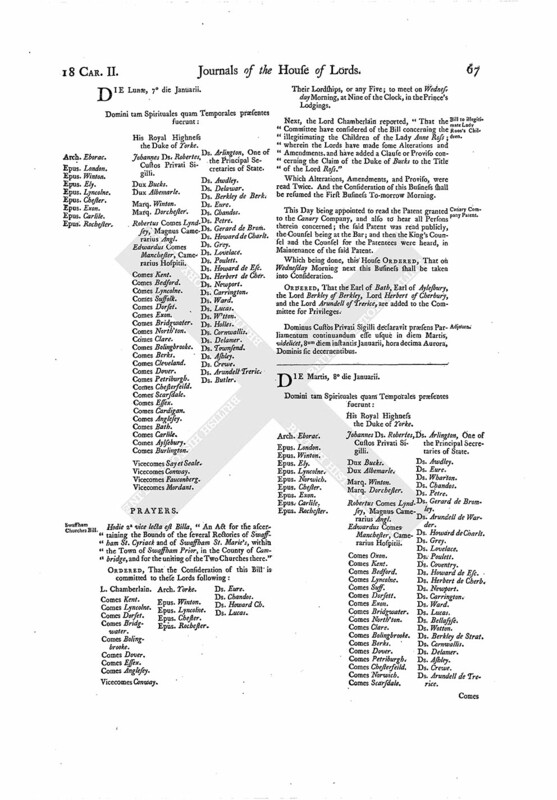 Next, the Lord Chamberlain reported, "That the Committee have considered of the Bill concerning the illegitimating the Children of the Lady Anne Ross; wherein the Lords have made some Alterations and Amendments and have added a Clause or Proviso concerning the Claim of the Duke of Bucks to the Title of the Lord Ross." Which Alterations, Amendments, and Proviso, were read Twice. And the Consideration of this Business shall be resumed the First Business To-morrow Morning. This Day being appointed to read the Patent granted to the Canary Company, and also to hear all Persons therein concerned; the said Patent was read publicly, the Counsel being at the Bar; and then the King's Counsel and the Counsel for the Patentees were heard, in Maintenance of the said Patent. Which being done, this House ORDERED, That on Wednesday Morning next this Business shall be taken into Consideration. ORDERED, That the Earl of Bath, Earl of Aylesbury, the Lord Berkeley of Berkley, Lord Herbert of Cherbury, and the Lord Arundell of Trerice, are added to the Committee for Privileges. Dominus Custos Privati Sigilli declaravit præsens Parliamentum continuandum esse usque in diem Martis, videlicet, 8um diem instantis Januarii, hora decima Aurora, Dominis sic decernentibus.